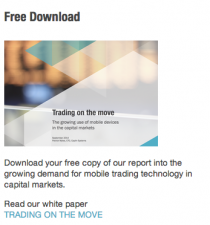 A few weeks ago, we explored last look’, ‘time stamping’ and ‘internalisation’, three practices that The Fair and Effective Markets Review FEMR, felt needed improved controls to help restore trust in FICC markets. The results, though limited and highly unscientific, are nonetheless interesting, as they highlight the almost diametrically opposite opinions of buyside and sellside. 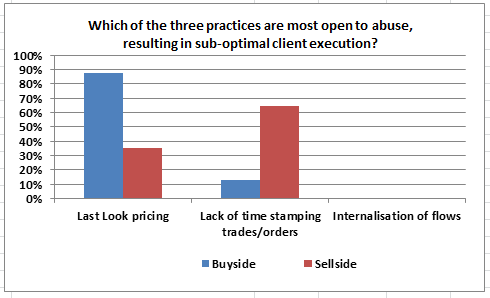 Buyside readers, overwhelmingly thought that the practice of ‘last-look’ was most open to abuse. Whereas sellside readers, who are at the sharper end of this, felt that although last-look was open to abuse, ‘lack of time stamping orders/trades ‘was far more likely to result in sub-optimal client execution.